Smoke pours out of the ventilation system at the Darling International livestock rendering plant. The fire started due to spontaneous combustion in one of the beef tallow cookers. 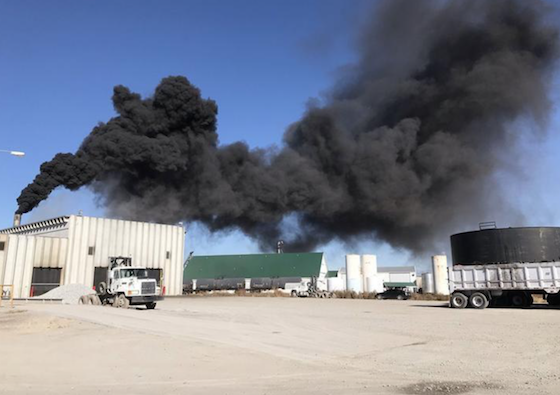 A fire broke out in the Darling International livestock rendering plant in Lexington, NE, Sunday afternoon, fire officials said. The cause of the blaze could have been attributed to either a bearing on a conveyer belt near the fire that was in bad shape or spontaneous combustion of beef tallow in the burner, said Lexington Rescue Chief Doug Glaze after talking to the State Fire Marshal who conducted an initial investigation. Assistant Fire Chief Bo Berry said the Fire Marshal had greater confidence in spontaneous combustion scenario. The fire was a difficult one to attack because of the layout of the plant the firefighters had to travel through multiple rooms to find the source of the fire, all of which were filled with smoke, Glaze said. Firefighters took quite a few precautions when entering a smoke filled building. Glaze said the nature of a rendering facility also added to the difficulties. The fire spread through a ventilation system that scrubs fumes from the facility and that secondary burns were caused by this throughout the facility, Glaze said. Berry said the air filtration system throughout the plant was completely destroyed. Some structural damage also occurred to areas of the plant made of plywood and timber, Glaze said. The LVFD requested help from the Overton Volunteer Fire Department (OVFD) in the form of water tanker because of no hydrant hookup in the location as well as extra manpower said Berry. Five members of the OVFD responded to the call for assistance. The fire departments also had assistance from the Lexington Police Department and Dawson County Sheriff’s Office who were on scene initially and helped guide the firefighters to where they thought the fire originated, said Berry. Don Price was called by the LVFD to provide a bucket truck so firefighters could combat hot spots on the roof of the facility, due to the fire the roof’s structural integrity was in doubt and could not be used to reach the trouble areas, said Berry. “After three hours we felt like we had the fire under control,” said Glaze, “We sent most of our people back to the station around 4 p.m.” The OVFD also left the scene around 4 p.m.
After the fire marshal inspected the facility members of the LVFD were called back to address hot spots.